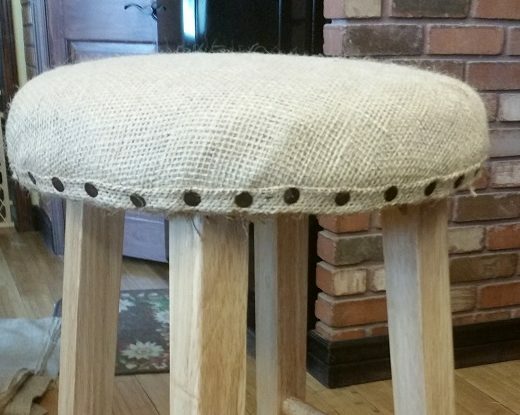 Creating a burlap bar stool is not difficult. The difficult part is not covering the entire house with burlap! I just love the rustic feel of it and the earthy tones. You can add lace, stamp, print, recycled jewelry and create all sorts of things. When I was decorating my home bar (it all started here), I decided I wanted a rustic feel to it. 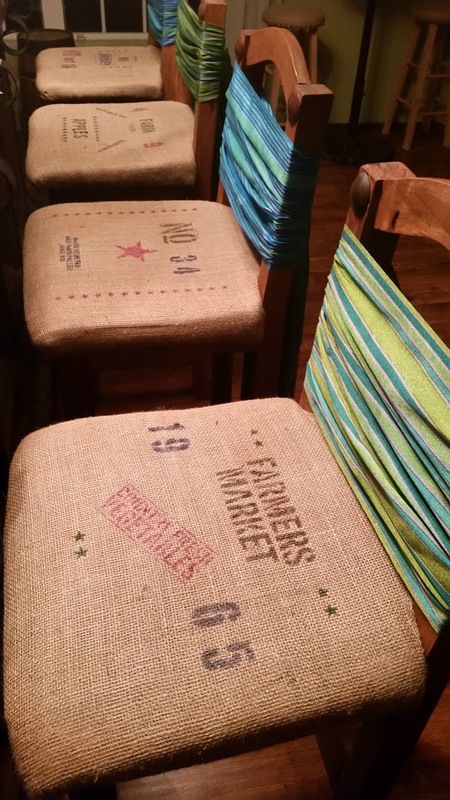 If you look at my front bar chairs redo I chose burlap and added some prints to create a “faux” coffee bag look to them. 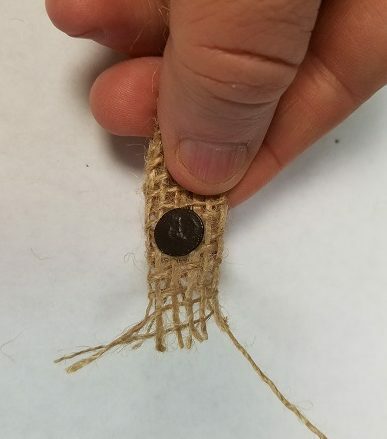 Coffee bags can be pricey and burlap is not. So it was easy to just recreate the coffee bag look with stamps and save a ton! But I needed more bar stools and tables for the home bar, but I didn’t want them to be as big as the ones in front of the bar. 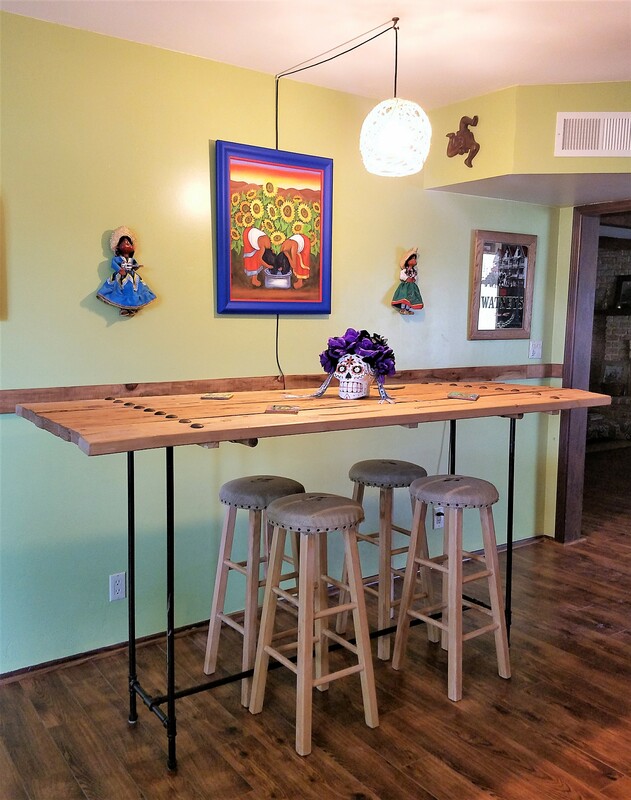 And because I needed quite a few stools for each of my bar height tables (the big table and the corner table) they had to be cheap and smaller. 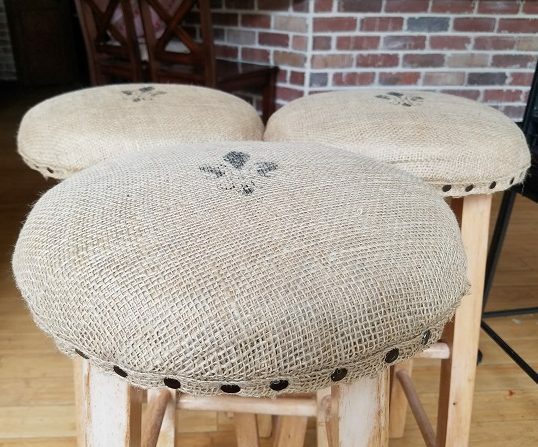 I found these simple bar stools for only $16 bucks each. Not bad considering I needed at least 6 of them. Because I wanted to create that rustic look I decided to add some dings and chips. This is optional. I just used a hammer and chains and worked on the legs (the only visible thing after I added the burlap). Then I applied some light stain over the legs to enhance the dings. Let it dry for a few days (don’t forget to do some light sanding over the original varnish or the stain will never stick). 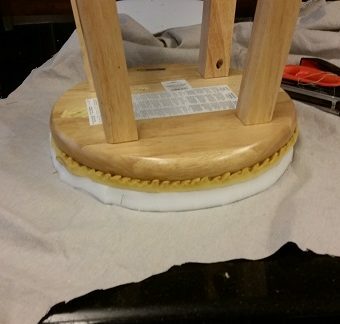 Start by cutting the foam using the stool seat as your guide. 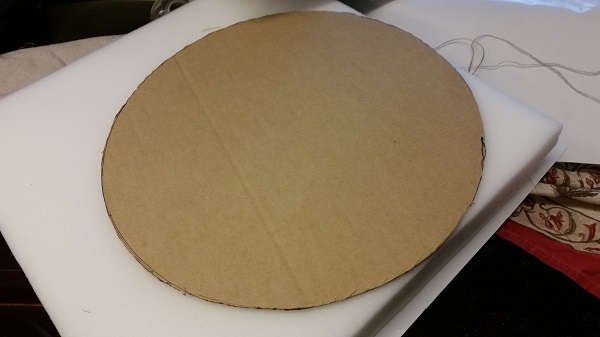 I just used a cardboard to create my pattern. 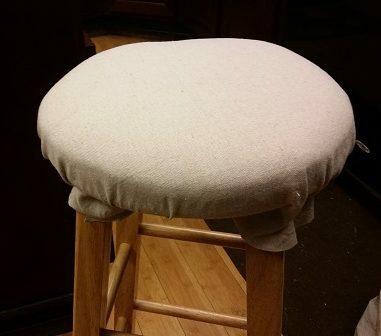 Easier that way, instead of balancing the stool over the foam. 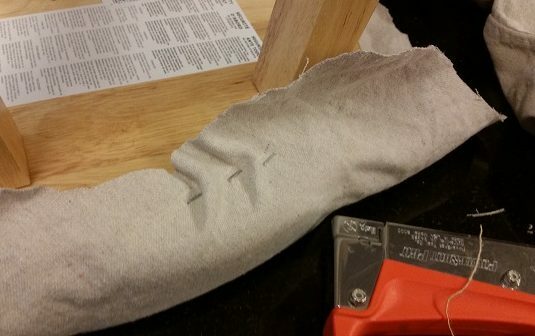 Once you have the foam sized, spray some of the spray glue over the wood seat and place the foam over it. Let it dry for a few minutes. Notice I improvised with my foam and used a piece of mattress topper because the foam I had was too thin and I was sure the husband would complain about that. Sigh! 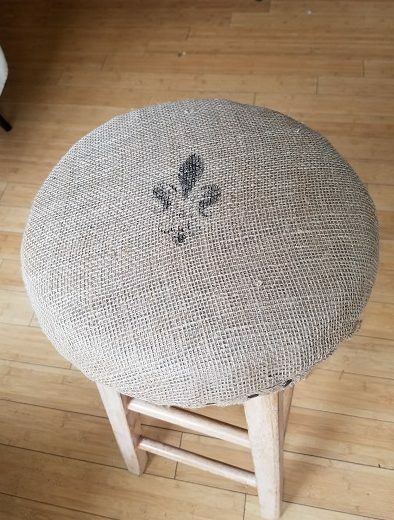 Be sure to pull the liner tightly to avoid bunching on the side of the stool. 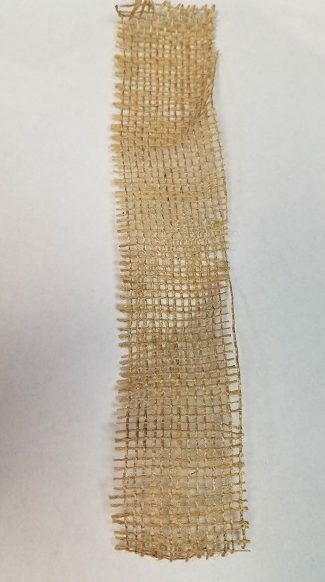 You don’t want any lumps showing under your burlap. It’s not suuuuper perfect but it will do. After the liner is in, it’s time for the burlap. This part is exciting because you can see your progress very quickly. 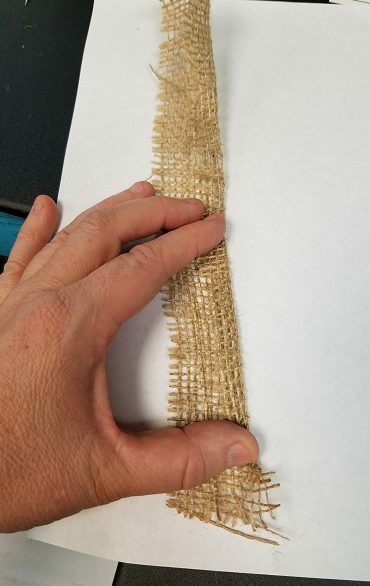 So just like the liner, start stapling your burlap, being careful to pull around the sides as you staple. Now, silly me forgot to take a picture of the bar stool after stapling and before the nail heads so the pic above is just a close-up. The next step is the fun part. You will need a cardboard or any styrofoam you have available so you can line up the nails for paint. You will need quite a few nails for each stool you are creating (about 35 nails on average). 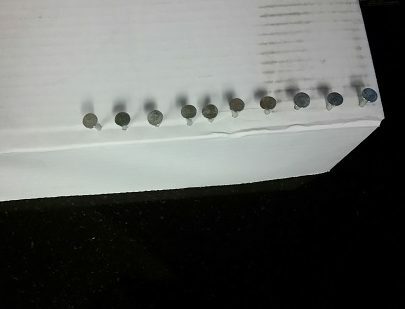 Simply stick each nail onto the cardboard or styrofoam so they are standing. 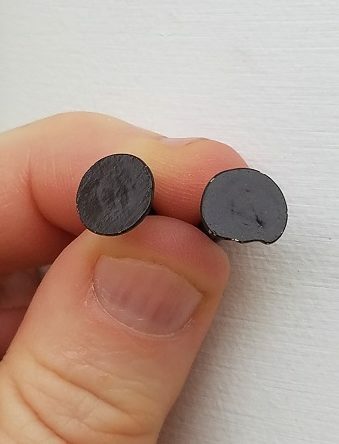 Do not press all the way in because you still want part of the “stem” of the nail painted to make sure nothing shows on the side when they are nailed onto the stool. Spray away!! They will be ready to go in an hour. 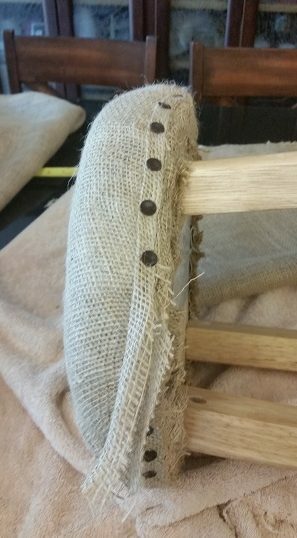 Since I wanted to match the nailheads on my bar tables and the actual bar, I chose I rusty brown color for my nailheads. Not quite the same color but close. I wish I could afford real “clavos” but they are oh so pricey. I think the “faux” ones turned out great and at a fraction of the cost. The box comes with over 300 (1lb) of these guys and I had plenty left when I was done. The real “clavos” cost an average of $0.50c each or more. 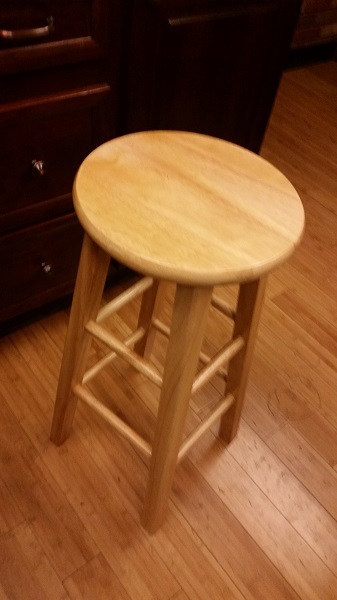 Considering you need an average of 35 nails per stool, it can add up. This part can be fun or frightening at the same time. You don’t want to hammer your fingers but you also want to see the finished product too. 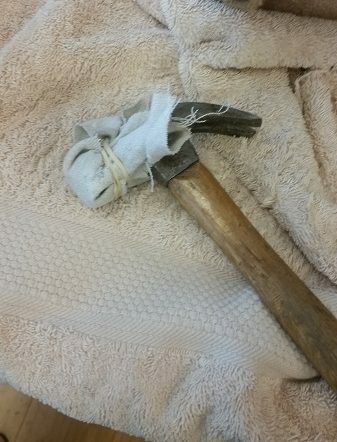 The first thing you need to do is cover your hammer with a little bit of foam or a folded up piece of fabric at the head of the hammer. 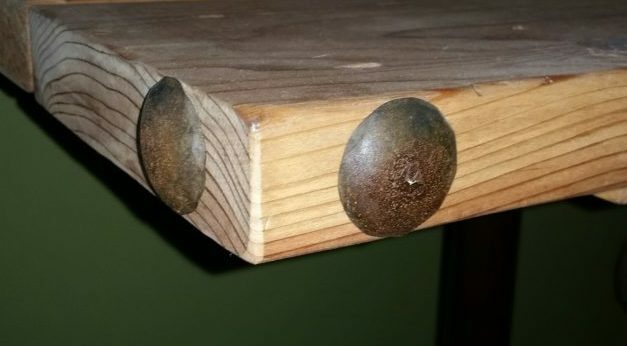 The reason is, if you don’t cover the hammer the painted nails can flake off or scratch and you also risk bending the nailhead. The next step is nailing these babies to the side of the stool. When you do, you can use a needle nose plyer to help you hold the nail while you hammer far enough that the nail won’t fly off your hand. 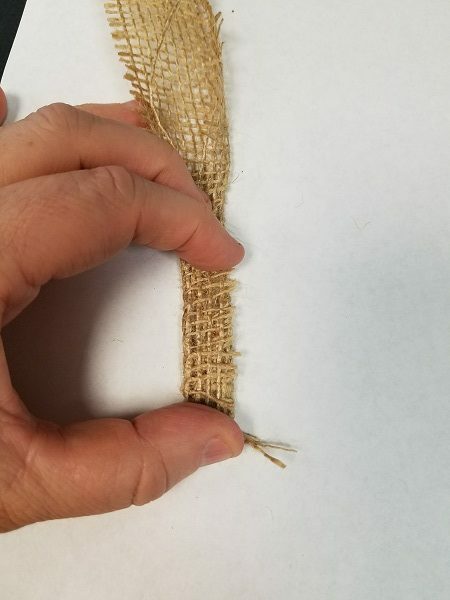 Cut a 2 inch wide strip of burlap that is long enough to wrap around the circumference of the stool plus an inch extra just in case. Next, fold it on one side (1/2 in), and then fold the other side over it (you can use an iron to flatten it and make things easier). Now that the burlap was in, it was time to add a final touch: a printed design to spice up the decor. 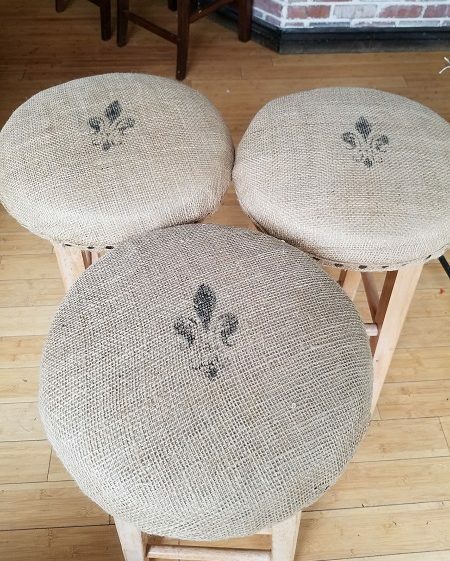 Since I was going for “Old West-y/Mexican Rustic” I decided to use a Fleur de Lis design. You can certainly choose other designs depending on the style you are going for like seashells, starfish, arrows, the sky is the limit here. You can buy or create your own stencils or use stamps (see my stamp tutorial here). and here they are around one of the tables. I hope you enjoyed this project. 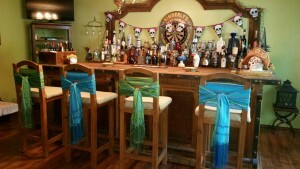 Below is another project I worked on to add character to my home bar. Don’t forget to follow us on Facebook and Pinterest for more projects and updates. Also, sign up for our email list below and receive new projects right in your inbox! Sign up and Get the Latest News, DIY project updates and more. As a thank you, receive a Project Budget Worksheet and start saving on your DIY projects today! Yes! I Want My Budget Worksheet! Grab Your Project Budget Worksheet Here!